*This seemingly random retrospective of Cloverfield was originally going to be featured as part of tomorrow’s Jaws 40th anniversary retrospective. In the retrospective, several TYF writers talk about their favorite movie monsters and what makes them their favorite. The length of my contribution ended up being a little too long to mesh well with the rest of the retrospective, so I am posting it separately in lead-up to the retrospective, which will be online at some point tomorrow morning. I would like to make it clear that when I began writing this article, I intended to do list of a few of my favorite movie monsters, with the Brundlefly from The Fly, David as The Werewolf from An American Werewolf in London, T-1000 from Terminator 2: Judgement Day, and The Facehugger from Alien, with the monster from Cloverfield included. Figuring that it would be my shortest entry, I decided to write a little paragraph about the Cloverfield monster first. Somehow I was soon two hours older, equipped with a bizarre epiphany that I cannot say I expected to reach, and if I had, I seriously need to be doing better things. 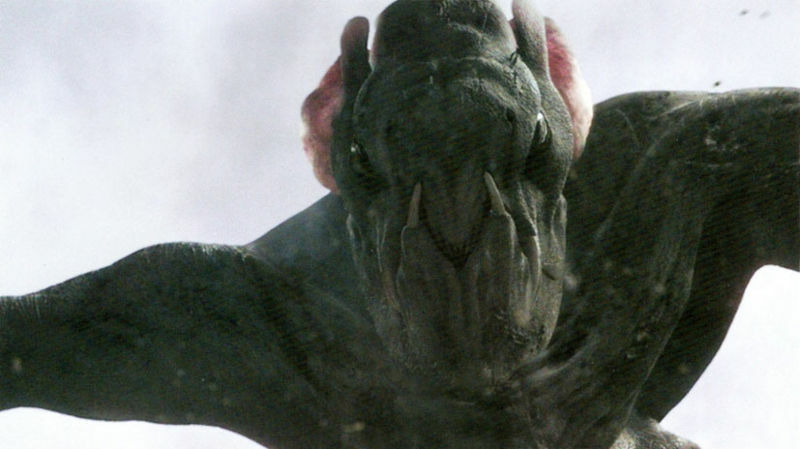 My epiphany was that the monster from Cloverfield is pretty damn great. When I first saw Cloverfield, I was so hooked by what was happening in the present that I did not even consider whether or not the monster would be fully shown by the end. Needless to say, I was shocked and terrified when the monster showed up out of nowhere in the closing minutes of the film. The choice to show the monster in its entirety only a few minutes before ending the film by cutting to black is perfect because it gives the viewer a few minutes to let that chill in their stomach seep into their bones. Why? Because we still have no idea what the monster really is. Some might argue that what I have just described is more a testament to the direction, cinematography, and editing of Cloverfield and less to the Cloverfield monster itself, but this is not so. The power of the film’s monster is that its design, which is actually quite silly and altogether mediocre, is not what is scary. In Jaws, the lead-up is great and the shark effects are equally great, holding up even today. In Cloverfield, the monster looks similar to a lot of the CGI monsters being force-fed to audiences in the late 2000s…if those CG creations happened to be a creepy mash-up of a huge spider, a hairless Weimaraner, a mouse, and a muscular version of Ralph Fiennes’s Voldemort. But for me, if the monster had been a very large, extremely hungry, and incredibly angry kitten the whole time, I still might have been a little creeped out. Being able to say something that ridiculous is exactly the reason why the monster in Cloverfield is among my favorites in film; the appearance itself is not really what matters, but the way it is presented. When the mysterious and most likely alien abomination gets into the camcorder’s frame out of practically nowhere, its silent reflection of you, the audience, through cold, soulless eyes brings the magnitude of what this beast has done to a tee. The monster that has destroyed most of New York City now has you in it’s grasps…this moment of realization is absolutely terrifying. One of the best sign of a truly great movie monster is when the atmosphere commands how the monster is perceived just as much or more than the design. Try imagining H.R. Giger’s xenomorph from Alien popping out of John Hurt’s chest with a bag that says “Have a nice day on it” saying, “Hey guys, sorry I’m late. I got the Chinese food. Let’s eat” in a comically average Joe voice. Would this scene scare you? I hope not. What makes a monster like the xenomorph scary is that in Alien, the silent atmosphere created by Ridley Scott’s direction is as scary if not scarier than the alien itself. What impresses me the most about the monster from Cloverfield is that it is the product of an atmosphere. Because what really makes a great monster is not just how grotesque it looks, but how grotesque it makes you feel. While many people have lost interest in Cloverfield over the last couple years, good cinematic atmosphere can be hard to come by, and in Cloverfield, you not only get great atmosphere but a fantastic movie monster out of it. Next ArticleSteven Universe 2x11 Review: "Keeping It Together"